Lunella Lafayette is a preteen genius out to change the world! Which would be a lot easier if she weren't living in mortal fear of her latent Inhuman gene. Just when she thinks she's found a solution, Lunella's life is turned upside down by the arrival of a red-scaled beast torn from the prehistoric past! 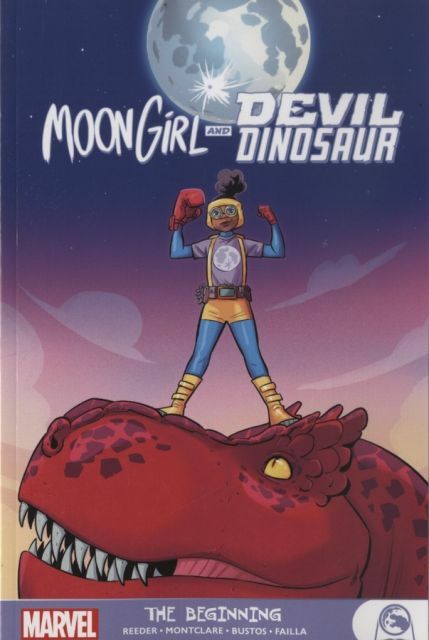 Together they become the most Marvelous Team-up of all: Moon Girl and Devil Dinosaur! But will they be best friends forever, or just until DD's dinnertime? And what happens when the two undergo a body swap? It's a big change-up that will see Lunella spending a freaky Friday (or whatever day it happens to be) as Devil Dinosaur, and vice versa! Lunella's got a huge future in the Marvel Universe - she just has to survive the present! Collecting MOON GIRL AND DEVIL DINOSAUR #1-12.